Genre: Let the Farce be with you. We can only hope. 😉 Glad you came by and liked. I love the double entendre of the bitter-sweetness in sangria and marriages. This sounds like the inaugural meeting of the First Wives Club. Made me laugh, women at their indomitable best. Well done Rochelle. The internet at the apartment is down so I may not make it this week. Writing this at a chinese restaurant at 10.00am! 🙂 Thanks for the laugh. I hope you can make it this week, but I understand. Bon apetit. Chinese is one of my favorites. I have a friend who’s always noodging me about my dark stories. She says, you’re so funny in person, why don’t you write humor? There, Terry. Happy now? Glad you liked it, David. I really did have a great time writing this one. Nice title, better story, perfect names, awesome author. Great comment. Wonderful muse. Awesome friend. Randy is as his name suggests. 😉 Glad you liked my story. Thank you for commenting. Enjoyable story. A private detective would have been useful to those ladies. Maybe they should suggest that to the wife-to-be. I’m afraid wife number 3 is going to find out for herself soon enough. Glad you enjoyed. It was fun to write. Glad you made it home safely. 😉 I missed your comments last week. It’s nice to know that someone actually pays attention to my tags. Thank you for your kind comments. Glad you liked it. I had fun writing it. The ex wive’s club! I like it! I agree that warning the fiancée is pointless. She’ll probably see them as bitter and unreliable. You are so right there. I’m sure she thinks it’s eternal love. 😉 Glad you liked. We are on the same wavelength with this one. Nice little vignette. I see that you were able to link up. Good. Glad you liked my story. It was a fun write. Nice, gave me a smile. Always happy to share a smile, M. Thanks for coming by and commenting. Some years ago, before Jan and I were married, I was with his mom on a trip. I got to be privy to her conversation with her second husband’s other ex. Seems they bonded over their, shall we say, experience with this man. One of two times I’ve seen my MIL tipsy. There’s nothing like the gathering of a “first wives club” on Valentine’s Day. The ending has a great punch. It was fun to write and based on fact. Glad you liked. Thank you. That was awesome! Reminds me of the movie- The other woman starring Cameron Diaz and Nicki Minaj 🙂 They decide to join forces instead of having a cat fight over an undeserving man. Wonderful Valentine’s day fiction Rochelle. I never saw that movie, but I think it’s a great theme. I really didn’t have any movie in mind. It’s based on a true conversation between two ex-wives who’d made the mistake with the same man. Glad you liked it. Awesome is always nice to hear. 😉 And a happy Valentine’s Day to you. Rochelle, You know what they say about the power of a trinity. Next year he is in real trouble. Could be the end of his run of Ex-wives. Very fun. Raising my glass to your story! Great fun. Hmm, maybe I should reach out to my ex’s ex’s. hahaha! Great fun read Rochelle. Stranger things have happened. Glad you liked the story. It was fun to write and based on a good memory. Haha, love it. And I love the genre for this story. The farce indeed. Nice to know that someone looks at the genre. I didn’t want to say “humor”. What if people didn’t think it was funny? 😉 Glad you enjoyed my story. 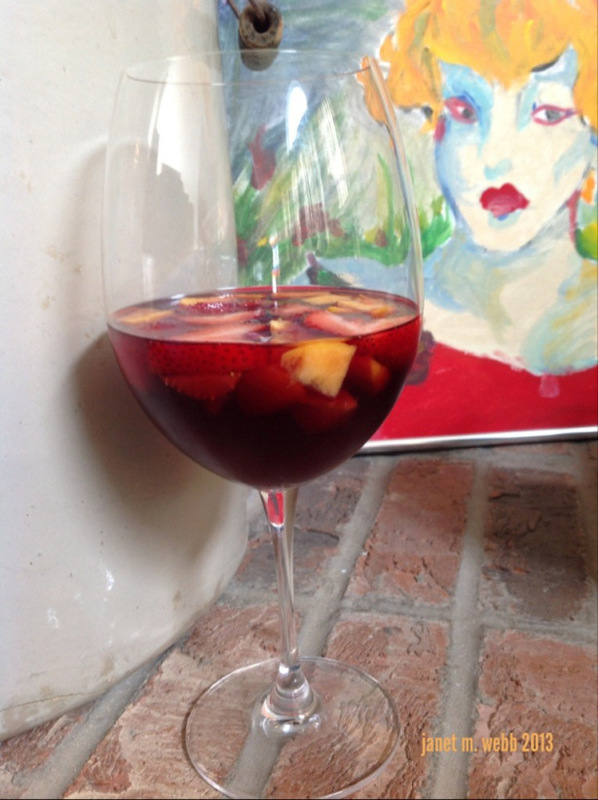 Well, I know sangria can be bitter, darling, but this takes the cake! Nice to see you can do funny, too! Your comment makes me smile. Funny was fun to do. Glad it worked. I am happy to say that you inspired this week’s FF. I feel oddly voyeuristic dropping in on the conversation, yet strangely glad I did. Thanks for eavesdropping. Glad you enjoyed. Oh my Rochelle, this on is delicious from the first sip! Love it!! “Marilee sipped her sangria and relished its bitter-sweetness.” Fantastic play on words. Bravo! Witty, clever, tightly written, and just fun to read… great job! Your comment puts a huge smile on my face. It means a lot to me for you to say such nice things. Thank you. I only say what I mean Rochelle… this story rocked! Man he’s a real slime ball. A least the new friends will have something to bond over. I wonder how many ex-wives there are who do bond this way? It’s based on a true conversation. Glad you liked. I would imagine more than we would think. Love the idea of an ex-wives’ club, Rochelle. Amusing and clever piece. Thank you, Hannah. I didn’t even think about the movie The First Wives Club when I wrote this. It was based on a conversation between my MIL and a friend. Both of them had been married to the same slime ball and had seen the error of their ways. I could picture them clinking glasses on the addition to the Wives Club. I have been there and really all you can do is laugh and have a cocktail. I enjoyed this quite a bit! Nice one, Rochelle. I enjoyed it. I’ll accept that. Thank you. Like “The Three Wives Club”…except with one husband. Wonderfully funny! Great story…and true to life. I think I know these women! LOL! Very true to life. It’s based on an actual conversation…or rather bash-fest. Glad you liked and commented. There’s bitterness and then there’s birds of a feather. 😉 Based on fact, I had fun with this one. Thanks for commenting. Great dialogue, Rochelle. I’ve heard it said that three’s a charm–perhaps the new wife will be his match and tame that bad boy. I’m not sure anyone ever did tame that bad boy. 😉 But at least these friends have something in common, eh? Thank you for the kind words. Oh the bonding of women over a shared loser. 🙂 very humorous and lovely read. I’m happy you enjoyed it, Deanna. I see a pattern here – I wonder how many women he can make mad. Funny! I think there’s the potential for him to repeat the pattern several times. Randy’s a narcissist. They don’t learn. Glad you liked. Poor Mr. Johnson. Obviously, the man has so much love to offer that it would be unfair to the rest of the female population if he limited himself to only one woman. I can understand their bitterness and disappointment, but let’s not turn sweet wine into sour grapes. These women! When will those three meet again? You never know, Patrick. Female bonding is a lovely thing. The prize for double entendre observation goes to you this week! Couple that last name with Randy and…need I say more? Glad you liked the story. Nice one Rochelle, lol. Nicely revealed relationship between two women, brilliant. Shalom. Great dialogue which creates a brilliant story, Rochelle. Nice one! I like the idea of their growing numbers as the “snake” barrels his way through wife after wife. Maybe number three will prove to be his match? We can only hope. 😉 But I wouldn’t make any wagers. Glad you liked. Oh I see a rented room in their future. Do I hear four ex-Mrs. Rat Bastards? Thanks for commenting. Great dialogue. I love the cynicism and the inevitability of adding another ex-Mrs. Johnson next year. Great read. Thanks for your kind comments. Glad you liked. Glad you liked. Thank you. Also, it appears you settled your issue with the inLinkz. Good. My apologies to your two ladies. I hope it is not ‘curtains’ for me, with them. Very funny with great dialogue. I particularly liked the ‘Two ex-Mrs Johnsons walk into a bar’ quip. just a perfect story, Rochelle. i love the friendship forming between these women. he better get ready for the showdown. ha-ha. Perfect? Pretty high praise. Thank you. Great job pulling the reader in, it really feels like you are there, at the table with them! Your comment makes me smile. It’s the ultimate goal as a writer to make the reader feel that she’s there. Thank you. Well i almost heard those women speaking inside my head! Amazing dialogues! Glad you could hear the voices. I try to write what the voices in my head tell me. 😉 Sooner or later the snake will reap what he’s sown. Very nicely done! I love your take on this prompt. I couldn’t ask for a nicer comment. Randy will eventually pay and we’ll all smile. Haha! Loved the ex-wives club theme here!! Glad you did. 😉 Something women can bond over. Looks like a super popular prompt this week.